This post was sponsored by Tony Chachere. Thank you for supporting our sponsors! It helps us keep going! Anyone notice how Thanksgiving usually ends up being all about the side dishes? That’s how it is in both our households anyway. We get so excited about things like delicious, buttery mashed potatoes, savory stuffing and bacon roasted brussels sprouts, that the turkey seems to end up a bit of an afterthought, with most plates filled to the brim with side dishes and a tiny sliver of turkey…usually covered in gravy, as it should be. 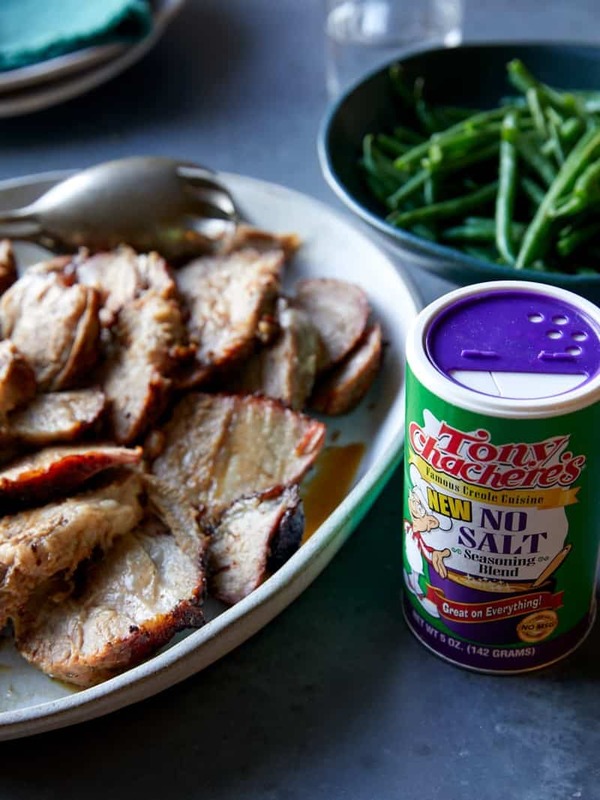 Today we have an alternative for people who give any kind of ‘side eye’ to Thanksgiving turkey, our Cajun Style Roast Pork using Tony’s Chachere’s No Salt Seasoning Blend! This recipe is so low maintenance and absolutely delicious! 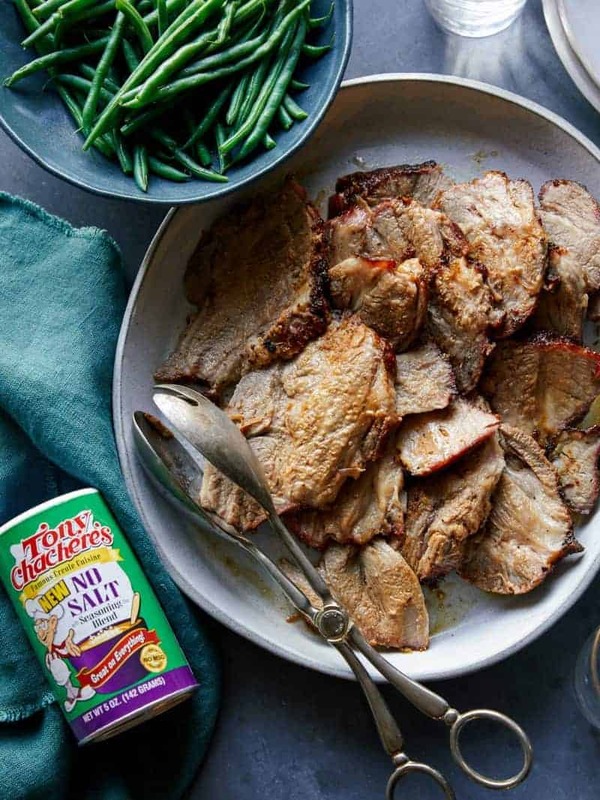 We love how much instant flavor this seasoning blend adds. We also love this recipe so much because it still feeds a large crowd and there’s zero brining involved. It just requires a quick rub down followed by as little as 4 hours or up to a day to hang out in the refrigerator before you’re ready to go. So easy! If you’re like us and tend to give Thanksgiving turkey the major side eye, this recipe is for you! Enjoy! Great post! 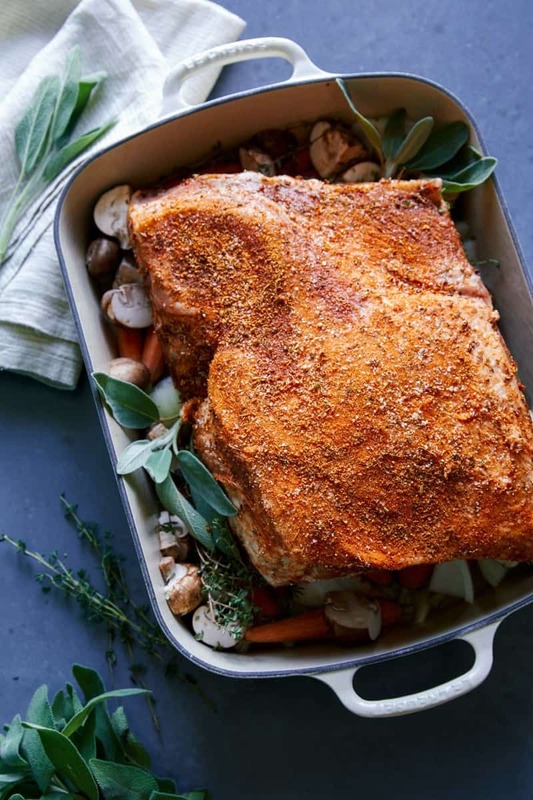 Do you leave the roasting pan uncovered in the oven the whole time? Any problems with the meat drying out? Thanks! Love the idea of this. Is it possible to do in a slow cooker? Thank you.